A sought-after red carpet hairstylist's guide to achieving perfectly tousled hair. Mastering the art of effortlessly undone hair is, admittedly, anything but effortless. (Like "no-makeup makeup" or a "natural sunless glow," multiple steps are required.) However, with the correct cocktail of volumizing and texturizing products, along with a clever styling technique, anyone can create perfectly tousled locks. For instruction, we turned to in-demand hairstylist Alex Polillo (see his work here), whose skilled artistry has made him the go-to for stars like Kate Mara, Erin Wasson and Olivia Wilde. As it happens, he is also among the handful of top stylists who contributed to the VIOLET GREY hair curation (read more about the curation in the Letter From The Editor). The artist put his skills into practice on actress Alice Eve, giving the British starlet big, touchable, not-too-precious hair. Polillo’s foolproof method includes massaging mousse directly into the roots, using a diffuser attachment when blow-drying, and finishing with a texturizing spray. Polillo’s secrets to mastering the art of undone hair, as well as The Violet Code–approved products he used, outlined below. The hairstylist’s step-by-step guide to achieving Alice Eve’s perfectly tousled hair. To begin, lightly mist freshly washed, damp hair with Sachajuan’s Ocean Mist from roots to tips, and comb through to ensure even distribution. This creates a desirable base for styling and activates any natural waves in the hair. Next, apply a golf-ball-sized dollop of Leonor Greyl’s Mousse Au Lotus Volumatrice. 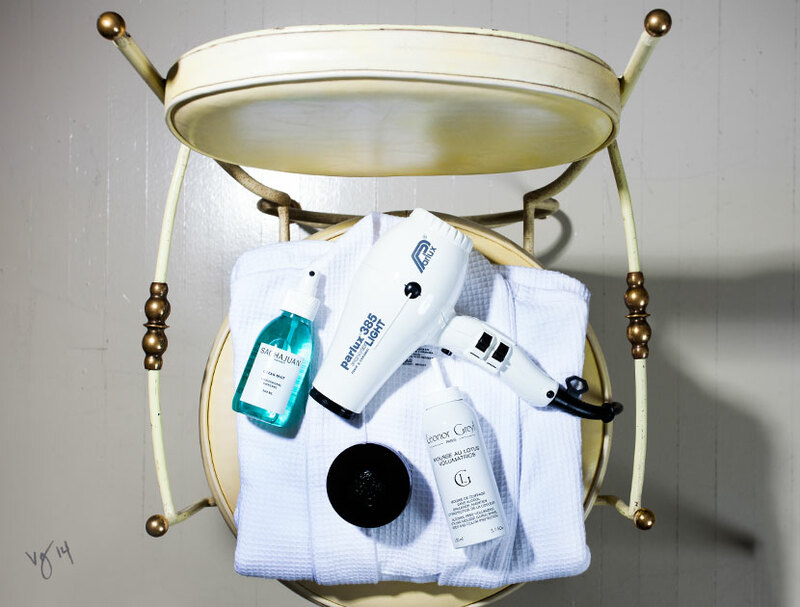 Massage the product directly into the roots of hair right before blow-drying. This creates volume without stickiness. Flip hair upside down, and blow-dry using a diffuser attachment, a technique that promotes natural texture in the hair and creates long-lasting lift at the roots. Once hair is dry, use a flat iron to add subtle waves and smooth any frizzy sections. Glide a one-inch iron over a one-inch horizontal section of hair to get it hot and ready to accept the texture, then quickly go over the section once more, rotating your hand like you are drawing the letter S. Repeat over random sections to ensure the hair has a non-uniform, natural look. Warm a pea-sized amount of Oribe’s Rough Luxury between your hands, and comb through the bottom half of the hair. This breaks up the waves and adds definition. Flip hair upside down, and spray Oribe’s Dry Texture Spray throughout hair for extra oomph. Then finish by lightly misting the hair with Leonor Greyl’s Laque Souple Hairspray for all-day hold. See the full shoot with the British actress, including the rest of the transformative looks created by Alex Polillo.